Serger sewing machines combine the utility of a serger — a machine that creates overlocking stitches along the edges of fabric to prevent fraying — with all the features of a standard sewing machine. This makes for a more complicated piece of machinery than a standalone serger or sewing machine, so complex repairs are best left to professionals. However, simple, at-home repair solutions — including a thorough cleaning of the machine's innards — often remedy common problems. You must know your way around a sewing machine before attempting repairs. Turn your serger sewing machine's pressure adjustment screw to increase or decrease the presser foot pressure if the machine does not feed fabric. Use higher pressure for heavy fabrics and low pressure for light fabrics. If adjusting presser foot pressure doesn't work, adjust the stitch length knob to a larger stitch length. Tighten the screws that hold the needle in place with a small screwdriver if you're experiencing needle malfunctions. Lessen the thread tension via the thread tension adjustment knob if the thread breaks. Puckered fabric often indicates overly tight thread tension. Rethread the machine with high-quality lightweight thread if broken thread or fabric jams continue to occur. Replace the machine's needle according to the instructions in your owner's manual if skipped stitches occur. Replace the trimming knives, following the manual's instructions, if you're experiencing irregular trimming. Line your work area with newspaper, including the area under the serger sewing machine. Unscrew the screws that secure the slide plate, throat plate, bobbin case and face plate — if they are secured by screws — and carefully remove these components. Remove the needle, presser foot and trimming knives. Brush the components free of lint with a dry cleaning brush. Soak them in a pan of manufacturer-recommended cleaning fluid. Cover the machine's motor with plastic wrap and tape the wrap in place to protect the motor from exposure to fluid and residue. Brush the inside casing of the machine and the surface of all its components with a small cleaning brush to remove dry lint buildup. Pull a piece of thread back and forth under the bobbin's tension discs to remove excess dirt, as though flossing between teeth. Scrape excess grease, dried oil, residue and packed lint from the inside the machine with your screwdriver. Focus on the machine head, getting into all the nooks and crannies. Spritz all the bearings and any parts where two operating components connect with a spray bottle of manufacturer-recommended cleaning fluid. Dampen a lint-free cloth in the cleaning fluid and thoroughly wipe every surface inside the machine, focusing on areas with visibly gummed dirt. Wipe the feed dog and bobbin case especially thoroughly. Allow the machine to sit overnight, letting the cleaning fluid dry. Remove the soaking components, wipe them with a lint-free cloth and set them on the newspaper to dry overnight. Squeeze a few drops of manufacturer-recommended lubricating oil on any part of the machine that rubs against another part. Reassemble the machine and operate it as usual. In many cases, thorough internal cleaning and lubrication serves as the easiest way to repair common problems. 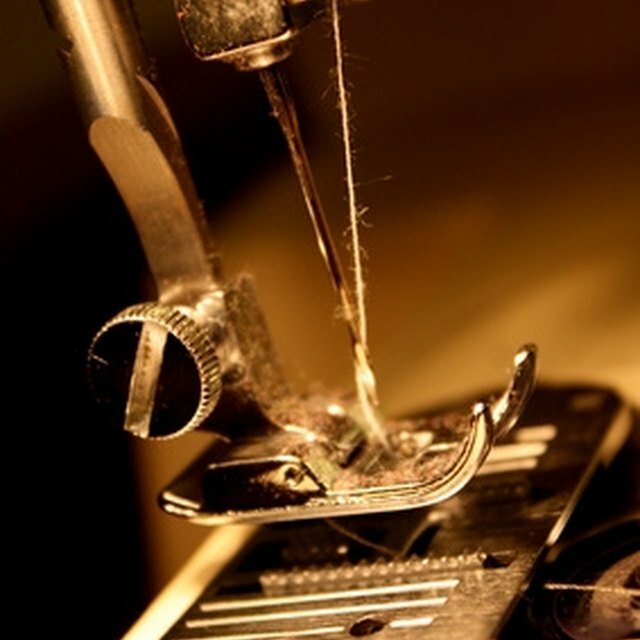 Contact the serger sewing machine's manufacturer if problems persist. Follow the manufacturer's instructions. The company may put you in touch with approved professional repair technicians. Examine the ventilating holes of your serger sewing machine and remove any obstructions, such as fabric or papers, to prevent the motor from overheating. Prevent common problems by dusting your machine free of lint after each use. Always unplug the serger sewing machine before attempting any repairs. Never oil the machine's tension discs, handwheel or rubber components.